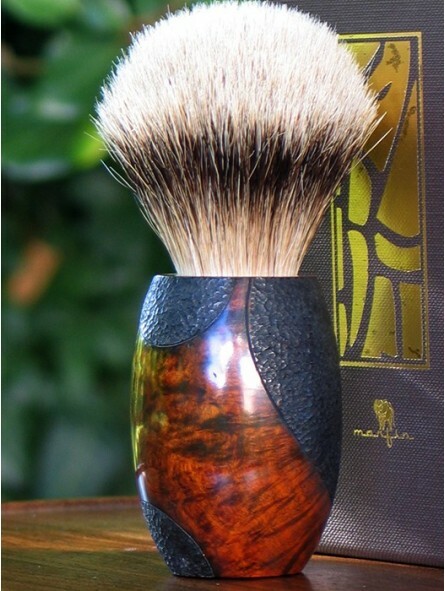 Marfin Silvertip Badger 393 Shaving Brush. The Marfin brushes are artisanal and made by the Italian artisan Marco Finardo. Impressive quality and design for this exclusive product. The brushes are artisan made, every piece is unique, you will not find two of the same. They are authentic works of art that the artist creates and each of them is stamped and numbered. This is an exhaustive process of manufacturing. The handles are made in ¨Radica di Erica Arborea¨, wood of Italian origin with extraordinary qualities. To reach the necessary waterproof qualities and resistance to soap, the handles are covered in Tung oil at a constant temperatura with diluted citric terpene. This inmersion lasts several days and it is then left to dry for 3 weeks. Once they are dry, the handles are polished up to 4 times, every time with a finest abrasive paste. After polishing and before assembling, the handles are waxed with Carnaúba Wax to protect the Wood. The was disappears after using it a few times, the Wood will have its natural shine. The handles are carved by hand with no mould, created one by one by the artist as unique and inimitable pieces. El nudo de la brocha está montado en Tejón punta Plata de primera calidad. 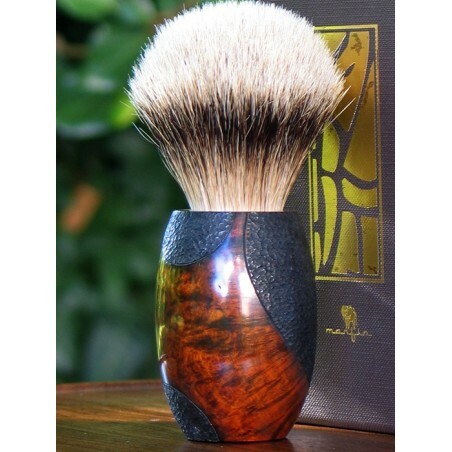 The knot of the shaving brush is made in pure silvertip badger hair.